An adhesion railway relies on adhesion traction to move the train. Adhesion traction is the friction between the drive wheels and the steel rail. The term "adhesion railway" is only used when there is need to distinguish adhesion railways from railways moved by other means, e.g. by a stationary engine pulling on a cable attached to the cars, by railways which are moved by a pinion meshing with a rack, etc. This article focuses on the technical detail of what happens as a result of friction between the wheels and rails in what is known as the wheel-rail interface or contact patch. There are the good forces, e.g. the traction force, the braking forces, the centering forces, all of which contribute to stable running. There are the bad forces which increase costs by requiring more fuel consumption and increasing maintenance that is needed to address fatigue (material) damage, wear on rail heads and on the wheel rims, and rail movement from traction and braking forces. The interface between the wheel and the rail is a specialist subject with continual research being done. Traction or friction is reduced when the top of the rail is wet or frosty or contaminated with grease, oil or decomposing leaves which compact into a hard slippery lignin coating. Leaf contamination can be removed by applying "Sandite" (a gel-sand mix) from maintenance trains, using scrubbers and water jets, and can be reduced with long-term management of railside vegetation. Locomotives and streetcars/trams use sand to improve traction when driving wheels start to slip. Usually the force needed to start sliding is greater than that needed to continue sliding. The former is concerned with static friction (also known as "stiction") or "limiting friction", whilst the latter is dynamic friction, also called "sliding friction". For steel on steel, the coefficient of friction can be as high as 0.78, under laboratory conditions, but typically on railways it is between 0.35 and 0.5, whilst under extreme conditions it can fall to as low as 0.05. Thus a 100-tonne locomotive could have a tractive effort of 350 kilonewtons, under the ideal conditions (assuming sufficient force can be produced by the engine), falling to a 50 kilonewtons under the worst conditions. Steam locomotives suffer particularly badly from adhesion issues because the traction force at the wheel rim fluctuates (especially in 2- or most 4-cylinder engines) and, on large locomotives, not all wheels are driven. The "factor of adhesion", being the weight on the driven wheels divided by the theoretical starting tractive effort, was generally designed to be a value of 4 or slightly higher, reflecting a typical wheel-rail friction coefficient of 0.25. A locomotive with a factor of adhesion much lower than 4 would be highly prone to wheelslip, although some 3-cylinder locomotives, such as the SR V Schools class, operated with a factor of adhesion below 4 because the traction force at the wheel rim do not fluctuate as much. Other factors affecting the likelihood of wheelslip include wheel size and the sensitivity of the regulator/skill of the driver. The term all-weather adhesion is usually used in North America, and refers to the adhesion available during traction mode with 99% reliability in all weather conditions. The maximum speed a train can proceed around a turn is limited by the radius of turn, the position of the centre of mass of the units, the wheel gauge and whether the track is superelevated or canted. Toppling will occur when the overturning moment due to the side force (centrifugal acceleration) is sufficient to cause the inner wheel to begin to lift off the rail. This may result in loss of adhesion - causing the train to slow, preventing toppling. Alternatively, the inertia may be sufficient to cause the train to continue to move at speed causing the vehicle to topple completely. For a wheel gauge of 1.5 m, no canting, a centre of gravity height of 3 m and speed of 30 m/s (108 km/h), the radius of turn is 360 m. For a modern high speed train at 80 m/s, the toppling limit would be about 2.5 km. In practice, the minimum radius of turn is much greater than this, as contact between the wheel flanges and rail at high speed could cause significant damage to both. For very high speed, the minimum adhesion limit again appears appropriate, implying a radius of turn of about 13 km. In practice, curved lines used for high speed travel are superelevated or canted so that the turn limit is closer to 7 km. During the 19th century, it was widely believed that coupling the drive wheels would compromise performance and was avoided on engines intended for express passenger service. With a single drive wheelset, the Herzian contact stress between the wheel and rail necessitated the largest diameter wheels that could be accommodated. The weight of locomotive was restricted by the stress on the rail and sandboxes were required, even under reasonable adhesion conditions. It may be thought that the wheels are kept on the tracks by the flanges. However, close examination of a typical railway wheel reveals that the tread is burnished but the flange is not—the flanges rarely make contact with the rail and, when they do, most of the contact is sliding. The rubbing of a flange on the track dissipates large amounts of energy, mainly as heat but also including noise and, if sustained, would lead to excessive wheel wear. Centering is actually accomplished through shaping of the wheel. The tread of the wheel is slightly tapered. When the train is in the centre of the track, the region of the wheels in contact with the rail traces out a circle which has the same diameter for both wheels. The velocities of the two wheels are equal, so the train moves in a straight line. If, however, the wheelset is displaced to one side, the diameters of the regions of contact, and hence the tangential velocities of the wheels at the running surfaces are different and the wheelset tends to steer back towards the centre. Also, when the train encounters an unbanked turn, the wheelset displaces laterally slightly, so that the outer wheel tread speeds up linearly, and the inner wheel tread slows down, causing the train to turn the corner. Some railway systems employ a flat wheel and track profile, relying on cant alone to reduce or eliminate flange contact. Understanding how the train stays on the track, it becomes evident why Victorian locomotive engineers were averse to coupling wheelsets. This simple coning action is possible only with wheelsets where each can have some free motion about its vertical axis. 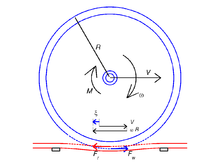 If wheelsets are rigidly coupled together, this motion is restricted, so that coupling the wheels would be expected to introduce sliding, resulting in increased rolling losses. This problem was alleviated to a great extent by ensuring the diameter of all coupled wheels was very closely matched. With perfect rolling contact between the wheel and rail, this coning behaviour manifests itself as a swaying of the train from side to side. In practice, the swaying is damped out below a critical speed, but is amplified by the forward motion of the train above the critical speed. This lateral swaying is known as hunting oscillation. The phenomenon of hunting was known by the end of the 19th century, although the cause was not fully understood until the 1920s and measures to eliminate it were not taken until the late 1960s. The limitation on maximum speed was imposed not by raw power but by encountering an instability in the motion. The kinematic description of the motion of tapered treads on the two rails is insufficient to describe hunting well enough to predict the critical speed. It is necessary to deal with the forces involved. There are two phenomena which must be taken into account. The first is the inertia of the wheelsets and vehicle bodies, giving rise to forces proportional to acceleration; the second is the distortion of the wheel and track at the point of contact, giving rise to elastic forces. The kinematic approximation corresponds to the case which is dominated by contact forces. where d is the wheel gauge, r is the nominal wheel radius and k is the taper of the treads. For a given speed, the longer the wavelength and the lower the inertial forces will be, so the more likely it is that the oscillation will be damped out. Since the wavelength increases with reducing taper, increasing the critical speed requires the taper to be reduced, which implies a large minimum radius of turn. where W is the axle load for the wheelset, a is a shape factor related to the amount of wear on the wheel and rail, C is the moment of inertia of the wheelset perpendicular to the axle, m is the wheelset mass. The result is consistent with the kinematic result in that the critical speed depends inversely on the taper. It also implies that the weight of the rotating mass should be minimised compared with the weight of the vehicle. The wheel gauge implicitly appears in both the numerator and denominator, implying that it has only a second-order effect on the critical speed. The true situation is much more complicated, as the response of the vehicle suspension must be taken into account. Restraining springs, opposing the yaw motion of the wheelset, and similar restraints on bogies, may be used to raise the critical speed further. However, in order to achieve the highest speeds without encountering instability, a significant reduction in wheel taper is necessary. For example, taper on Shinkansen wheel treads was reduced from 1:40 to 1:16 for both stability at high speeds and performance on curves. The behaviour of vehicles moving on adhesion railways is determined by the forces arising between two surfaces in contact. This may appear trivially simple from a superficial glance but it becomes extremely complex when studied to the depth necessary to predict useful results. The first error to address is the assumption that wheels are round. A glance at the tyres of a parked car will immediately show that this is not true: the region in contact with the road is noticeably flattened, so that the wheel and road conform to each other over a region of contact. If this were not the case, the contact stress of a load being transferred through a line contact would be infinite. Rails and railway wheels are much stiffer than pneumatic tyres and tarmac but the same distortion takes place at the region of contact. Typically, the area of contact is elliptical, of the order of 15 mm across. In analysing the dynamics of wheelsets and complete rail vehicles, the contact forces can be treated as linearly dependent on the creep (Kalker's linear theory, valid for small creepage) or more advanced theories can be used from frictional contact mechanics. The forces which result in directional stability, propulsion and braking may all be traced to creep. It is present in a single wheelset and will accommodate the slight kinematic incompatibility introduced by coupling wheelsets together, without causing gross slippage, as was once feared. Provided the radius of turn is sufficiently great (as should be expected for express passenger services), two or three linked wheelsets should not present a problem. However, 10 drive wheels (5 main wheelsets) are usually associated with heavy freight locomotives. The adhesion railway relies on a combination of friction and weight to start a train. The heaviest trains need the highest friction and the heaviest locomotive. The friction can vary a great deal but it was known on early railways that sand helped and it is still used today, even on locomotives with modern traction controls. To start the heaviest trains the locomotive has to be as heavy as can be stood by the bridges along the route and the track itself, and all the weight of the locomotive has to be shared equally by the wheels that are driven with no weight transfer as the starting effort builds up. The wheels have to turn with as steady a driving force as possible on the very small contact area of about 1 sq cm between each wheel and the top of the rail. The top of the rail has to be dry with no man-made or weather-related contamination, such as oil or rain. Friction-enhancing sand or an equivalent is needed though. All the driving wheels have to turn faster than the locomotive is moving (known as creep control) to make use of the maximum coefficient of friction that is available and all axles have to be driven independently with their own controller because different axles will see different conditions. The maximum available friction occurs when the wheels are slipping/creeping. If contamination is unavoidable the wheels have to be driven with more creep because although friction is lowered with contamination the maximum obtainable under those conditions occurs at greater values of creep. The controllers have to respond to different friction conditions along the track. Some of the above requirements were a challenge for steam locomotive designers - "sanding systems that did not work, controls that were inconvenient to operate, lubrication that spewed oil everywhere, drains that wetted the rails, and so on.." Others had to wait for modern electric transmissions on diesel and electric locomotives. The above requirements disappear as the train picks up some speed because the frictional effort needed at the rails drops steadily with increasing speed and the nature of the wheel/rail contact patch changes as described below. A driven wheel does not roll but actually turns faster than the corresponding locomotive movement and the difference between the two is known as the "slip velocity". "Slip" is the "slip velocity" compared to the "vehicle velocity". When a wheel rolls freely along the rail the contact patch is in what is known as a "stick" condition. If the wheel is driven or braked the proportion of the contact patch with the "stick" condition gets smaller and a gradually increasing proportion is in what is known as a "slip condition". This diminishing "stick" area and increasing "slip" area supports a gradual increase in the traction or braking torque that can be sustained as the force at the wheel rim increases until the whole area is "slip". The "slip" area provides the traction. During the transition from the "all-stick" no-torque to the "all-slip" condition the wheel has had a gradual increase in slip, also known as creep and creepage. High adhesion locomotives control wheel creep to give maximum effort when starting and pulling a heavy train slowly. Slip is the additional speed that the wheel has and creep is the slip level divided by the locomotive speed. These parameters are those that are measured and which go into the creep controller. On an adhesion railway, most locomotives will have a sand containment vessel. Properly dried sand can be dropped onto the rail to improve traction under slippery conditions. The sand is most often applied using compressed air via tower, crane, silo or train. When an engine slips, particularly when starting a heavy train, sand applied at the front of the driving wheels greatly aids in tractive effort causing the train to "lift", or to commence the motion intended by the engine driver. Sanding however also has some negative effects. It can cause a "sandfilm", which consists of crushed sand, that is compressed to a film on the track where the wheels make contact. Together with some moisture on the track, which acts as a light adhesive and keeps the applied sand on the track, the wheels "bake" the crushed sand into a more solid layer of sand. Because the sand is applied to the first wheels on the locomotive, the following wheels may run, at least partially and for a limited time, on a layer of sand (sandfilm). While traveling this means that electric locomotives may lose contact to the track-ground, causing the locomotive to create EMI-emissions and currents through the couplers, or in standstill, when the locomotive is parked, "track-release-relays" may detect an empty track because the locomotive is electrically isolated from the track. ^ "Combined Adhesion ad Cog-Wheel Railways". The Railway News and Joint Stock Journal. London. 51 (1307): 100–101. January 19, 1889. ^ Engineering Mechanics. PHI Learning Pvt. Ltd. 2013-01-01. ISBN 9788120342941. ^ Shoukat Choudhury, M.A.A; Thornhill, N.F; Shah, S.L (2005). "Modelling valve stiction". Control Engineering Practice. 13 (5): 641–58. CiteSeerX 10.1.1.135.3387. doi:10.1016/j.conengprac.2004.05.005. ^ École Polytechnique Fédérale de Lausanne. "Traction Electrique - Principes de base" (PDF). ^ "EPR 012: Testing of locomotive all weather adhesion" (PDF). RailCorp. October 2011. Retrieved October 25, 2014. ^ "Science of Railway Locomotion". www.brooklynrail.net. Retrieved 2016-02-04. ^ "Locomotive Sanding Systems & Rail Traction | Cyclonaire". Cyclonaire. Retrieved 2016-02-04. ^ "The Adhesion Rail Riddle - Ensuring Trains Can Brake | Engineering and the Environment | University of Southampton". www.southampton.ac.uk. Retrieved 2016-02-04. ^ Bernd Sengespeick (2013-08-08). "Hybrid vehicle air conditioning service" (PDF). EBA. Archived from the original (PDF) on 2016-09-17. Retrieved 2013-08-08. Carter, F. W. (July 25, 1928). On the Stability of Running of Locomotives. Proc. Royal Society. Inglis, Sir Charles (1951). Applied Mathematics for Engineers. Cambridge University Press. pp. 194–195. Wickens, A. H. (1965–1966). "The Dynamics of Railway Vehicles on Straight Track: Fundamental Considerations of Lateral Stability". Proc. Inst. Mech. Eng. : 29. Wickens, A. H. (Jan 1, 2003). Fundamentals of rail vehicle dynamics : guidance and stability. Swets & Zeitlinger.